Wells Fargo & Company (NYSE:WFC) topped consensus estimates on EPS and revenues in its earning report Friday before the opening bell. Shares of WFC are so far are up 1.77% on the day. 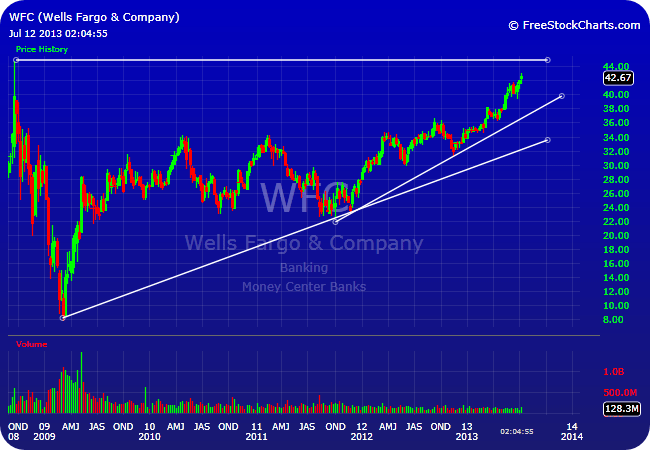 Wells Fargo is showing extreme relative strength in the financial sector, making new all-time closing highs again this week while most banks are well off previous highs. The stock has been in a steady uptrend since the market bottom in March 2009, and even showed considerable relative strength during the financial crisis. After hitting it’s 52 week low on November 14th of last year, the bank entered a new short-term uptrend and continues to make higher highs and higher lows. After pulling off slightly in the two days leading up to this morning report, the bank hit a 52 week high early today before pulling off slightly. The only resistance level remaining is the all-time intraday high of $43.08 from September 2008.